Post by Hannah Barath, Access and Diversity Co-op student. I get very excited about Halloween. Without a doubt, my favourite part is seeing fun and creative costumes. The one part that has never appealed to me is the horror, because I get scared way too easily. Fortunately, I can usually avoid all things scary. Unfortunately, the most frightening sight is one that is more difficult to avoid. Culturally appropriative Halloween costumes are surprisingly common but also horrifying, and if you’re unsure why, then read on. Cultural appropriation is a tricky topic to navigate, but a fairly basic definition is the unauthorized use of practices, items or symbols from a non-dominating culture that has typically been (historically and continuously) oppressed and exploited. The person who appropriates belongs to a dominating or different culture than the one they are mimicking. In the context of Halloween, if a person wears a costume that depicts a culture they do not belong to, that person is appropriating. In even simpler terms, the costume is racist. Although there are so many bright individuals at our university, racist and appropriative costumes are sadly something that is common, especially this time of the year. The problem with these costumes is that they often represent a culture as a (negative) stereotype. Stereotypes fail to acknowledge the diversity within a culture, instead conflating the culture into a shallow depiction of what it truly is, while trivializing the history and significance of practices, items, and symbols. Often these costumes are also sexualized, which adds another problematic aspect as historically, sexualisation and the demonizing of sexuality has been used as a tool of oppression again non-dominating cultures. 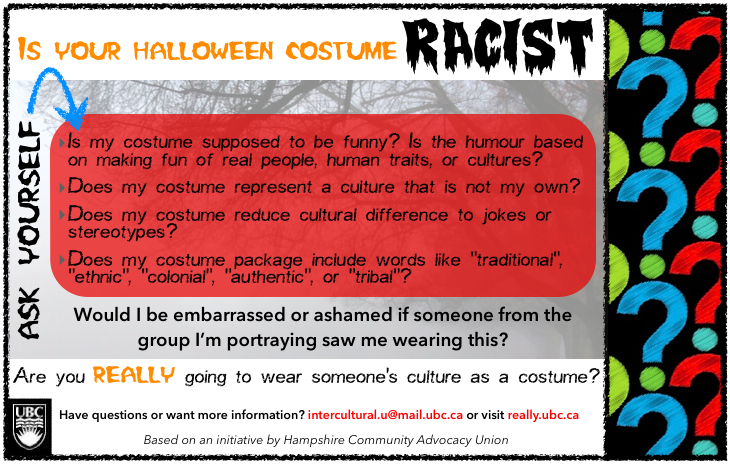 While all culturally appropriative costumes are equally bad, considering where UBC is located I think it’s important to spend some extra time on discussing appropriation of Indigenous culture(s). Geographically, the UBC Point Grey and Okanagan campuses are located on the traditional, ancestral, and unceded territories of the xʷməθkʷəy̓əm (Musqueam) people and Okanagan Nation (Sylix) Territories, respectively. Most members of the UBC community are uninvited visitors and settlers, and as such I think our obligations to the Aboriginal communities whose land we occupy have to go beyond land acknowledgements. It is also our responsibility to learn about the past and continued violence these communities face and actively participate in decolonization work. Reducing Indigenous people to a one-dimensional stereotype is just one example of the ongoing oppression, silencing, and violence that Aboriginal peoples face. Unnecessarily sexualized Halloween costumes are in themselves problematic, but in combination with appropriating Indigenous cultures it is particularly so. Aboriginal peoples, especially women, have historically been constructed as sexually deviant, so costumes and stereotypes that reinforce Aboriginal women as heavily sexualized are both disturbing and upsetting. According to a statistical report from 2013, Aboriginal females in Canada make up 4.3% of the population, but make up about 11.3% of missing females and approximately 16% of female homicides. The effect of perceived deviance combined with other aspects of colonization has led to devaluation and disregard for Aboriginal lives. I think that everyone can agree that this is wrong. Other popular costumes that are culturally appropriative are dressing as a Mexican, a geisha or wearing blackface. Each and every one of these culturally appropriative costumes have real and damaging consequences for these groups. Although the intent behind wearing a costume that is culturally appropriative may not be malicious, it is still a choice that stems from ignorance, privilege, and racism. As part of a university that aims to “value and respect all members of its communities,” offensive and oppressive actions should be opposed by all members of UBC. Cultural appropriation erases the real life challenges that non-dominating groups face and is an inherently violent action that perpetuates negative stereotypes and oppression of these communities. So what can you personally do? First of all, never wear a costume, on Halloween or otherwise, that is culturally appropriative. If you’re still unclear on why cultural appropriation is bad or if your costume is appropriate there are many online resources. Take some time to educate yourself, and then educate your friends by sharing this or other articles, or by talking to them. If it feels safe to do so, call someone out on their racist costume. In summary, keep talking and eventually the culture of acceptance toward cultural appropriation will shift. Before wrapping up I want to acknowledge that cultural appropriation is not isolated to Halloween or dressing up. Incorporating practices, items or symbols that have a significant meaning from another culture into your own is also a form of cultural appropriation. Please take some time to educate yourself on respectful ways to appreciate other cultures, and what the difference between appropriation and appreciation is. If you are interested in learning more or if you have any questions regarding cultural appropriation, make sure to attend the panel discussion that the UBC Sociology Students’ Association and Anthropology Students’ Association are hosting on October 30. This entry was posted in Race & Ethnicity, Social Justice by cjrowe. Bookmark the permalink.